Everyone, and I mean everyone, has a little bit of something. May this be a feeling of failure, a fear, or an insecurity, we all (myself included) have a little bit of something. There is no ‘perfect’ mental health, we are all just individuals trying to live a happy life. The time to seek help is when this ‘little bit of something’, becomes a larger part of your life. By coming into therapy, you're merely addressing, challenging and changing negative patterns of behavior, which in turn, teaches you to become your own therapist. So let’s take a minute to clear up the taboo around seeking help for mental health. Mental health issues can either be biological, such as a chemical imbalance. This can often lead to schizophrenia or bipolar, and these can be managed through medication and counseling with a psychiatrist or psychologist. Mental health problems deriving from a chemical balance are 1 in 100 people. There are, however, 1 in 6 of the population enduring anxiety or depression. That means that more likely than not there is a high probability of someone in your workplace or social group with anxiety or depression. Anxiety and depression are merely the results of self-critical and black and white thinking patterns, with a tendency to avoid difficult situations. That is it. Just because you endure a panic attack during a work meeting, or feel depressed to the point where you want to withdraw from all around you, does not make you ‘crazy’, it just means that you need to highlight and change harmful thinking and behavioral attributes. If you wouldn’t look at a broken arm and think, “I know it’s bad but I’ll just leave it a few months and see if it gets better on its own,” then please don’t do this with your mental health. Much like a broken arm, broken heads heal better when they’re treated quickly. 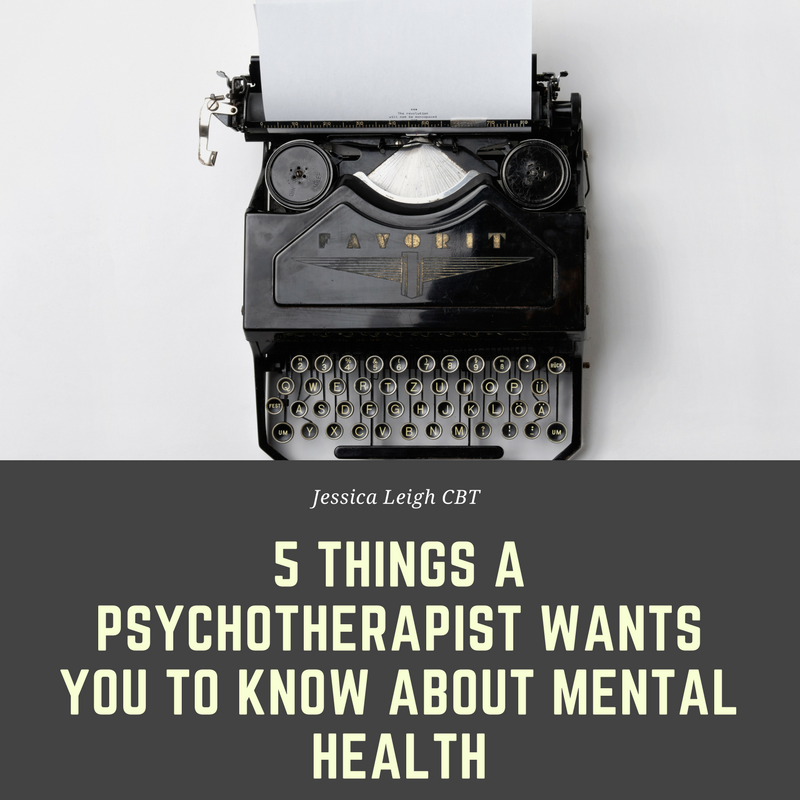 Most clients have the preconception that therapists will not be sympathetic as to what you're going through, or have a ‘get over it attitude’. The reason I studied for 8 years to become a psychotherapist, is because I want to help you. I want you to reach your view of happiness. I will be your biggest advocate and supporter of your mental health journey. So when you come in and tell me a ‘crazy thought’, I understand, I am not judging you, I understand what you're going through. There is no such thing as perfection, it is a myth. The reason for this is perfection is completely subjective to the eye of the beholder. You will never reach perfection because to someone else, perfection is something else. Don’t spend your life chasing the white rabbit. Imperfection allows for growth, discovery, creativity and the possibility of a better tomorrow. Perfectionism mostly just allows for the growth of stomach ulcers.